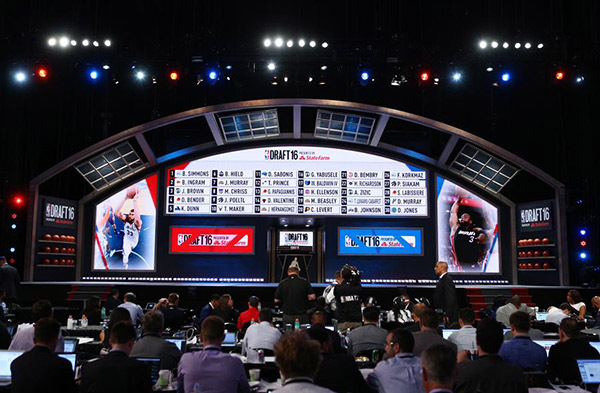 A general view of a video board displaying all thirty draft picks in the first round of the 2016 NBA Draft at Barclays Center in New York in this file photo taken on Jun 23, 2016. The Celtics will get the No. 3 pick, plus an additional first-rounder in either 2018 or 2019, according to the person who spoke on condition of anonymity Saturday night because the trade has not been formally approved by the league. The agreement between the Celtics and 76ers was struck not long after Fultz worked out for Philadelphia. Philadelphia at No. 1, the Los Angeles Lakers at No. 2, Boston at No. 3 and Phoenix at No. 4. "It would be pretty cool. Just being with a young team," Fultz said. "The upside of it would be crazy. I'm close to home, so a lot of my family can come out and just show love. This city has great fans. "The 6-foot-4 guard averaged 23.2 points, 5.7 rebounds and 5.9 assists in 25 games during his lone college season at Washington, excelling on a team that finished 9-22 and lost its final 13 games. Fultz led the Pac-12 in scoring and finished No. 6 among all Division I players, and was the top freshman scorer in the country.